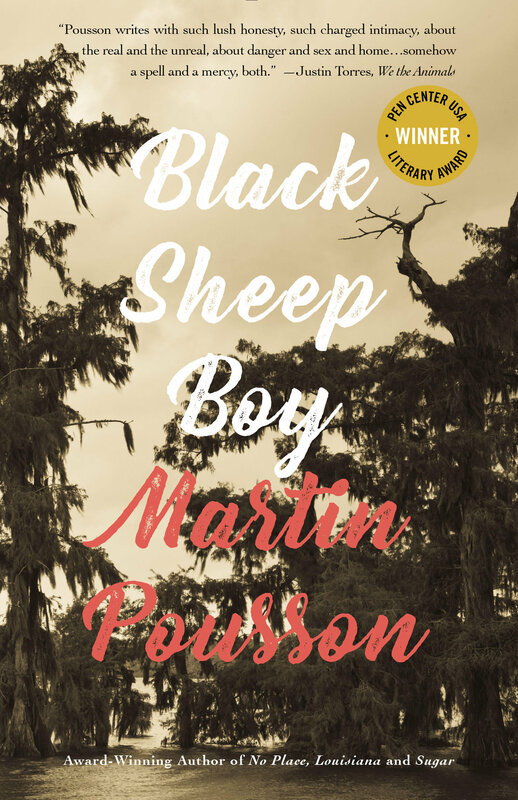 Author and poet Martin Pousson’s Black Sheep Boy (182 pages; Rare Bird Books ), winner of the 2017 PEN Center USA Award for Fiction, and re-issued in paperback last month, is an unforgettable novel with prose that reads as both brutally honest and hypnotic. The story centers around our narrator, Boo, as he struggles with growing up gay in Acadiana, the bayou lands of Louisiana. 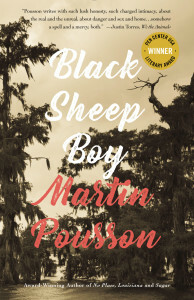 Told over the course of sixteen linked stories, the book covers a wide span of time, from the “wild-hearted” boy’s birth to his freshman year of college, and centers around the qualities that make him the “black sheep” of the title. Boo is unable to fit the masculine identity that his family, religion, and community demand of him. During childhood, his manner of movement and speech convinces his superstitious and abusive mother he is possessed by the devil: “Mama strapped down my restless hands with duct tape then ordered a doctor to fit braces on my twisting feet. By five, I’d learned sacrifice for the stutters when another doctor cut out a flap of flesh to correct my tangling speech. Mama showed me the horn-shaped piece to prove a point: the devil had me by the tongue.” His father, meanwhile, is mostly absent as he works from sunrise to sunset to meet his wife’s ever increasing demands for a piece of the good life she feels she deserves. Boo is called Sissy, Queen, Fairy, and Jenny-Woman as he encounters drag-queens, priests, and neighborhood bullies. He has a variety of sexual encounters; some sweet and gentle, others haunting and traumatizing. At times the writing is so fantastical that it is difficult to find a more grounded, emotional connection to the storytelling, but that does not take away from the power of these stories. Pousson wastes no word. Black Sheep Boy represents an entertaining and dazzling read, and serves as a heartfelt ode to those the author addresses in his dedication: the “odd ducks, strange birds, and queer fish” among us. The boldly and rather ironically named Love (125 pages; Archipelago Books), written by Norwegian author Hanne Ørstavik, was originally published in her native country in 1997. Twenty years later, it has now been translated into English by Martin Aitken and is being released in the United States by Archipelago Books, perhaps in part due to the steady demand here for dark, noir-like literature out of Scandinavia. 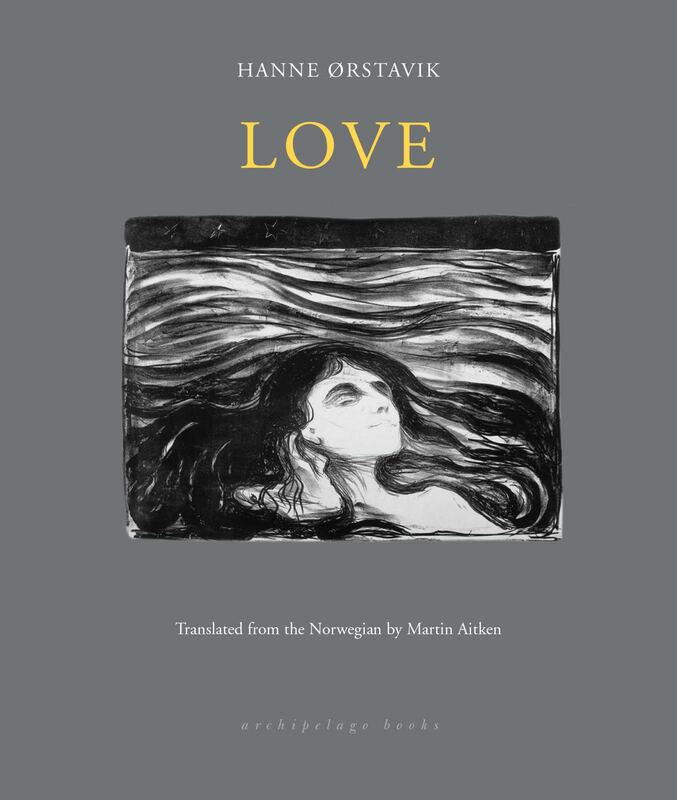 Exploring many opposing themes, including hope, disappointment, longing, and unrequited love, the novella tells the story of Vibeke and her young son, Jon, who have recently moved to a secluded town in the northern reaches of Norway. The action of the story takes place over the course of just one day as mother and son go off on their separate journeys. Ørstavik invites the readers into her two characters’ innermost thoughts, seamlessly switching back and forth between their perspectives— often within the same paragraph. Their stories unfold breathlessly close together on the page, suggesting the strong link between mother and son that Vibeke’s actions betray. It is the day before Jon’s ninth birthday and he spends the majority of it by himself. He takes Vibeke’s absence to mean she is busy planning a special celebration for him, but as readers we know this isn’t true; her designs are much more self-involved. Though it’s easier to be angry with Vibeke rather than sympathetic, her deep loneliness and insecurities are apparent. Her character proves selfish and single-minded: she doesn’t think about what it takes to be a good mother, she wants to find a man. To that end, she cares about being beautiful; her needs come before Jon’s. In contrast, Jon constantly thinks of his mother. He wonders where she is, what she’s doing, and fantasizes about his birthday cake and the train set he hopes to receive. As their nights progress, a creeping sense of tragedy brews within the story. Vibeke spends her evening bar-hopping with a man she met at a traveling carnival, while Jon bounces from stranger to stranger, accepting their offers to stay warm. Though Love is only one hundred and twenty-five pages, its careful craft and beautiful details make it worth savoring—right to its haunting but inevitable conclusion. 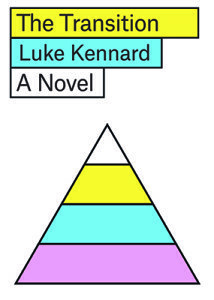 With frequent moments of insightful social commentary, Luke Kennard’s first novel, The Transition (328 pages; FSG), takes us to an exaggerated version of our current society—a dystopian world of recognizable stress. Karl and Genevieve are both university-educated and hold decent jobs. Genevieve works as a teacher, and Karl has a dubious career as a fake product reviewer and ghostwriter for lazy college students who can afford his services. In the first few pages of the novel, we learn things have gotten to the point where the “average age of leaving the parental home drifted into the early forties.” At the same time, things such as male contraceptive implants, self-driving taxi cabs, and self-refilling refrigerators are common. Without the help of their parents to fall back on, Karl and Genevieve struggle and flail. In their early thirties, they still can’t afford to live alone — instead they rent a room in a shared house; having children remains out of the question. As rents keeps rising, Karl (secretly) opens up more credit accounts to pay for groceries, car repairs, and vacations they can’t afford. Whenever Karl complains about their lot in life, Genevieve reminds him that they are still wealthier and better off than ninety-seven percent of the world’s population. To pay off some of his debt, Karl becomes involved in credit fraud and is ultimately caught. He is given an offer: go to jail for fifteen months, or participate in a pilot scheme called the Transition. After choosing the latter, he and Genevieve spend six months living with older mentors who guide them through concepts like employment, finances, relationships, and more. In other words: Adulting 101. The goal of the program is that by the end of their sentence, the couple will have paid off their debts and have enough money saved for a down payment on a house. This too-good-to-be-true “Get Out of Jail Free Card” soon becomes a burden to Karl. He continues to land himself in trouble, and his relationship with Genevieve grows increasingly strained. Karl’s developing suspicion of the ill intentions of The Transition becomes the novel’s central conflict. Though Kennard expertly introduces new conflicts and builds suspense, there’s no dramatic conclusion to his story. In fact, the novel is consistently anticlimactic; just when you think there will be an aha! moment, Kennard adds another layer of complication and ambiguity. (Are the villains really villains or simply people looking out for themselves?) And each character is flawed in their unique ways. The Transition is not as easily definable as a typical dystopian novel. 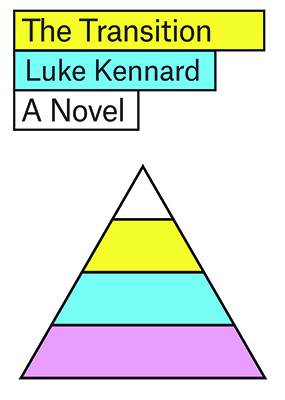 Kennard writes cleverly about an unlivable economic climate, sprinkling instances of lovely nuance and truthful observation throughout. The novel never preaches or patronizes the reader. Instead, The Transition serves as a funny, fresh, and all too likely depiction of the future.